Lieutenant Commander Rebecca Waddington (left) and Captain Kristie Twining (right) prepare to hunt some hurricanes. Rebecca Waddington arrived in Long Beach, California, last weekend. The 35-year-old was preparing for her first hurricane-hunting mission with the National Oceanic and Atmospheric Administration (NOAA) the following day. The pilot had flown for the federal department before to survey marine mammals or even post-hurricane damage—but never to approach an active cyclone. She was feeling excited and prepared. 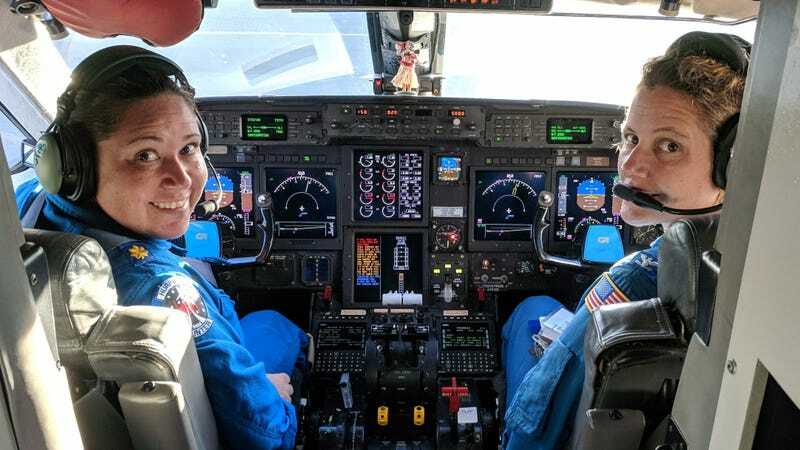 But little did she know that her first hurricane hunting mission would also become the first ever to be piloted by two women, in a program that stretches back over two decades. Sure, the crew in the back navigating the computers was all men, but baby steps, my friends. Waddington and her co-pilot, Kristie Twining, set out over the Pacific in their specially equipped, Gulfstream IV aircraft on the morning of August 5. After two hours of flying, the pair saw some white clouds and knew they had arrived at Hurricane Hector. At the time the Category 4 hurricane was charging toward Hawaii, which is why NOAA dispatched its hurricane hunters in the first place. When a hurricane threatens any U.S. land, hurricane hunters—who have been taking to the skies since 1997—must go check it out. Some, like Waddington and Twining, fly at an altitude of about 45,000 feet in the Gulfstream IV, moving above or around the cyclone, while others use a P-3 aircraft to fly directly into the eye of the storm at a lower altitude of 10,000 feet. In either case, they are collecting data that plays a critical role in hurricane forecasting. The Gulfstream IV is more focused on understanding the upper atmosphere weather systems that steer hurricanes in order to predict where they’ll end up. It might catch some turbulence here and there, but they mostly catch sick views of the storm as they throw dropwindsondes into its path. These instruments measure the storm’s pressure, humidity, temperature, and wind direction, according to NOAA. Where the crew left the dropwindsondes along Hurricane Hector’s path. “The whole time [the dropwindsondes are] sending data to plane where the crew is quality checking it,” Waddington told Earther. Luckily, the instruments were able to confirm that the storm’s trajectory would take it south of the Hawaiian islands. Hector is still moving along, now past the islands, as a major hurricane, having kicked up powerful surfs earlier in the week. Waddington and Twining’s eight hour Sunday flight was a success, as were follow-up flights out of Honolulu on Monday and Tuesday. They didn’t encounter any surprises during the mission, which they’re always prepared for. Right now, NOAA has 39 pilots, Waddington said, and they’re all pretty close. Only five are women, though. Luckily, Twining was Waddington’s instructor pilot, so all Waddington’s training flights had happened with her. That made the ride over the weekend that much smoother. Waddington recognizes how badass of an achievement it is to be part of the first all-female flight crew, but she says it didn’t change the experience much for her. The tone was calm and collected, as she’d expect with any co-pilot because that’s the culture among NOAA’s hurricane hunters, she said. Waddington hopes one day these types of events won’t be newsworthy because they’ll just be so common. Women add a new perspective, she said, and science, tech, engineering, math, and aviation need more of them. Plus, women rock when they get to ride in the front.